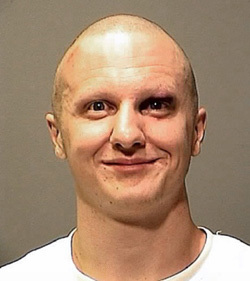 Jared Lee Loughner's mug shot. The level of despise one must have... for the "controlled" ones. Ok! So we are conscience dreaming, so we can build our values, our lifestyle, many times unconsciously determined by the language that we use. So, if we perceive that, we can control where we live, what we eat, what we do and think, what we desire! So what m*****f*****? Do you think it's ok to kill people just to spread your message? Don't you know what a forum is? Why should people care? "What's government if words don't have meaning?" They don't have meaning for you, but they do reflect the will, the aspirations, the problems, of millions of voters, dumb f***!! You have no idea on what you have done. Thus, Jared Loughner is asleep"
And let's give out the great hope that you have, to let "literate people" find that they have the power of creating their own "currency", their own values, their own interpretation of the world. That they can develop "lucid dreaming"... Discovering that they are nothing but conscience dreaming of that moment. you M****F****! How do you expect people will respect you or your vision if you have no respect for others! What kind of horrendous effigy did you choose for your coins? You're lucky if they'll give you the death penalty. If you're considered crazy you'll spend the rest of your life living the hell of one of your once favorite book: not over but inside the Cuckoos nest! Such complicated theories, such lack of love. This reminds of the Matrix and all of those movies where lives can be taken to reach some higher goal! Jared, man, you're no better than all those other warmongers out there. Were you trying to free people? Man! We're already free! We just like hanging on to something. Where is this society going to? obviously, a true theory must work. But false theories may also work. For instance, the geocentric model allows us to predict when the sun will rise, movements of the stars and planets, etc. sometimes, to get even a small amount of improvement in what the theory can do, we must radically change the assumptions that are at its base. (like in the Copernican revolution, or passing from Newtonian gravity as attraction to Einstein's gravity as spatio-temporal deformation). Now, why wouldn't the same distinction apply to "oriental" theories about the inner self. I mean the fact that, for instance, searching for fluidity works, augments inspiration, etc, only proves that it works. Which, in itself, is an important achievement. I mean, it's not everyday that one finds something that works. But to deduce, from the fact that it works, that the assumed metaphysics is correct (that chi is really an energy that exists, for instance), is something completely different. To be clear, one should assume only that a particular method works and ascribe, at most, a certain probability to the associated metaphysical view to be correct. Confusing the usefulness of a theory to its truth leads to gigantic negative consequences, like people believing in the truth of religions and so on (which work rather well in some dimensions and paths), which in turn leads to despising or looking down on people who don't agree with our metaphysics, lack of communication and understanding, attempting to "teach" the other and defend our view from others' skepticism, making groups of people who are intolerant of others or that proselytize to others, wars, death, unimaginable suffering. And it all started with a very small mistake, almost to small to seem important.